Ada Louise Davenport was born March 31, 1867 in Elk Creek, Pennsylvania. After her parents divorced, she moved with her mother to Buffalo, NY. When she was 20, she became the first woman reporter for the Buffalo Express which infuriated the city editor Frederick Kendall. He objected strenuously but within two years they were married on June 4, 1890. They eventually had four children. Her newspaper column was called “The Garrett Philosopher,” which ran for 16 years. She also wrote poetry, and gave readings and talks around town. Ada was well aware of the growing movement to win voting rights for women nationally. 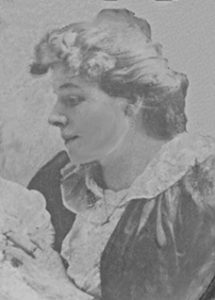 She met visiting suffragist Mrs. Harriett Stanton Blatch in 1910, and within a short period of time was participating in soap box speeches on Buffalo’s street corners, following the lead of women in New York City. Ada continued her work for the cause in Buffalo, marching and speaking as the leader of the Erie County Suffragists, which led to her traveling to Washington, DC. In the late afternoon of September 13, 1917, Ada, along with five other suffragists, stood in front of the gates of the White House. They were all arrested and sentenced to the Occoquan Workhouse at the DC Prison in Lorton, Va.
Ada was kept in solitary confinement for most of her stay in the Workhouse. She was given dirty clothes, a pail for a toilet and nothing but bread and water to eat. According to author Winslow Eliot, her great-granddaughter, Ada made “friends” with one of the rats during her time in solitary, supposedly naming him “Machiavelli,” and shared her tiny portion of maggot-infested food with the animal. Following passage of the 19th Amendment recognizing women’s right to vote, Ada kept writing her newspaper columns and was very active in her community. In her later years, she travelled to Europe and took up painting in her 70s. She died on April 14, 1950, in her home in Hamburg, New York. Source: Inez Haynes Irwin, The Story of the Woman’s Party.